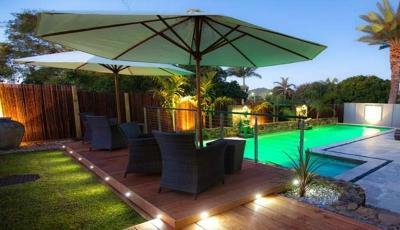 Lock in a great price for Aabi's at Byron – rated 9.6 by recent guests! A serene place to stay in a town that can be some what hectic. It has free parking which is a premium in Bryon Bay. We left our car and walked everywhere. It is also, just far enough out of town to be quiet but not that far, that you can't walk. we loved it! Aabi's is an excellent location, within in easy walking distance of beaches, restaurants and shops, and an easy drive to the lighthouse and surrounding towns. The swimming pool and bbq facilities are excellent. The bed was extremely comfortable. Staff really friendly! I didn't catch the German lady on receptions name, but she was a star! So kind and helpful! Aabis is absolutely beautiful! The pool and the lounge area is stunning, the vibe is totally a private resort feel. The bed is super comfortable and the bathroom is very spacious. And just few minutes away from the light house and beach! Perfect location to the main part of town. Very quiet location too. Uber is only $8 to the main part of town. Walking is not a problem at all if you chose to do so. Staff were great. We also left our luggage at reception after checkout for the entire day without any problems. 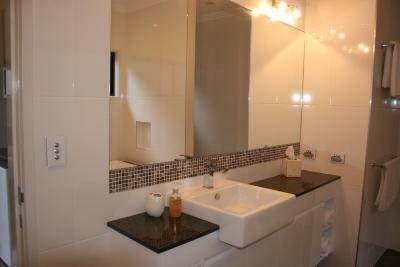 There is also two kitchens that are available for use if you need. King sized beds are really comfortable, rooms very clean and proximity to city center was good. The site is 4 streets back from the 'action' of Byron Bay which is a bonus cos it gets loud late at night on the weekends. Staff were lovely. The room and the hotel, in general, were extremely clean and tidy. Loved the minimalist interiors and exotic exterior landscaping around the entire hotel, especially the pool. Room was spacious and facilities very well appointed. It is close to shops, restaurants and the beach. Staff members were very helpful. Aabi's at Byron This rating is a reflection of how the property compares to the industry standard when it comes to price, facilities and services available. It's based on a self-evaluation by the property. Use this rating to help choose your stay! Aabi's at Byron is an adults only retreat offering luxury accommodations in a relaxing, smoke free environment. Guests can dine in the outdoor BBQ hut which overlooks the saltwater pool, heated hot tub and sun lounges. Free WiFi and secure on-site parking are provided. Aabi's at Byron guest house is a short 3-minute walk to Jonson Street, which offers a wide range of restaurants and cafes serving fresh local produce. It is a 10–minute walk to Byron Bay’s pristine Main Beach. Adventurous types can enjoy a scenic 40-minute hike to the famous Cape Byron Lighthouse, or take a 40-minute drive to the beautiful Minyon Falls. Each stylish, air-conditioned room features a private private bathroom, 36-inch flat-screen TV and a DVD player. 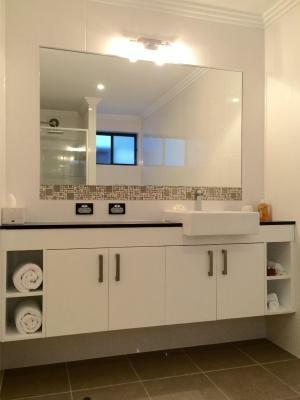 Extra touches include 2 free water bottles, tea/coffee making facilities and delicious Byron Bay Cookies. After a day of exploring, guests at Aabi's can unwind with an in-room massage. Additional shared guest facilities include a spacious living area with board games, a fully equipped eat-in kitchen and a full laundry. Popular activities in and around Byron Bay include kayaking with dolphins, hang gliding, surfing, skydiving and hot air ballooning. 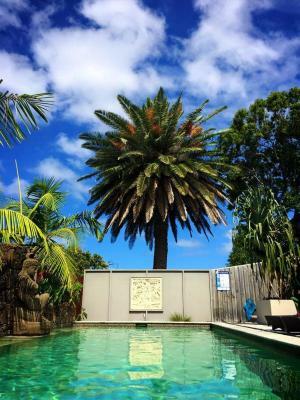 When would you like to stay at Aabi's at Byron? 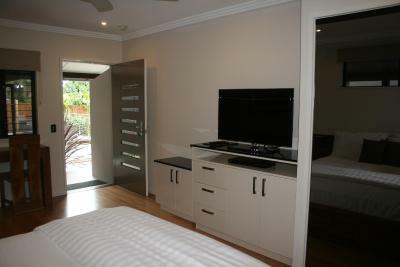 This air-conditioned room features a kitchen, flat-screen TV with blue-ray player and a separate lounge area. This room does not have a balcony. Air-conditioned room is fitted with a flat-screen TV, a blue-ray player and a shared patio with outdoor seating. This air-conditioned room features a balcony and a flat-screen TV with a Blue-Ray player. 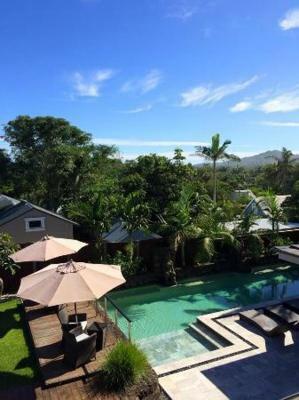 Aabis@Byron combines 4.5 star luxury with adults only exclusivity, located in a central & surprisingly quiet part of beautiful Byron Bay. House Rules Aabi's at Byron takes special requests – add in the next step! Aabi&#39;s at Byron accepts these cards and reserves the right to temporarily hold an amount prior to arrival. Aabi's at Byron accepts these cards and reserves the right to temporarily hold an amount prior to arrival. Please note that Aabi's at Byron does not accept payments with American Express credit cards. Please note that on-site car parking is limited and subject to availability. More space is available on street. Please note that housekeeping service is only offered for stays of more than 4 nights. Please inform Aabi's at Byron of your expected arrival time in advance. You can use the Special Requests box when booking, or contact the property directly using the contact details in your confirmation. I loved the staff being very responsive and respectful. Peaceful and modern rooms that were a great size! Highly recommend coming back. I think we should have gotten some kind of room service with that price after 4 days. I would have liked some fresh towels and toiletry top ups without having to ask. And to have a to pay for a change of sheets I also found unreasonable as the place was not cheap enough for that. We loved how quiet it was through the night which made it easy to have a good night sleep. Loved the rule about no children. Enjoyed the spa and the pool and the location was great as well. Overall enjoyed our experience! Location was amazing and the rooms the best I have stayed in! With complementary coffee machine and complimentary coffee pods fresh milk... it exceeded any expectations I did have and we will definitely be back! Great accommodation in a good location, with great staff, great amenities and a very well maintained complex. Its just stunning and highly recommend for couples wanting quality accommodation. The location is nice, close to the shops and beach. The room is clean and has everything we need. Very quiet at night as well. We probably will stay there if we go to Byron Bay again. Really like it! The location was perfect and the staff were lovely. The atmosphere was beautiful. Great location and good idea with the outside kitchen area. Justin and the team did a great job! Everything is clean and modern. Communal kitchen and pool cabana were really helpful. Aabi's has everything you need. we hired bikes so was very easy to get into town.